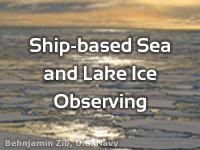 Ships operating in areas with ice are expected to report conditions as part of standard weather reporting procedures. This lesson is aimed at those tasked with this responsibility, be they official or informal observers. The lesson begins with background information on ice, addressing such topics as where it is found, how it develops, and how to observe and report it. This sets the stage for the lesson’s scenarios, which simulate the experience of being an ice observer in four situations: on the U.S. Coast Guard Cutter Healy operating in the Arctic Ocean, on a container ship transiting the North Atlantic shipping lanes, on an oil tanker operating in an area with icebergs, and on the U.S. Coast Guard Cutter Alder breaking ice on Lake Superior. Each scenario provides numerous opportunities to identify and report ice. These reports provide important information about local conditions and are vital to many users - from mariners deciding on route planning and ice monitoring organizations tasked with keeping waterways open to environmental scientists. THIS TRAINING IS BEUTIFUL, AND I REALLY ENJOYED IT, THANK YOU. Picture questions on test was ridiculous. Way too hard. My experience with observing sea ice is entirely microwave remote sensing from space, so it is very informative to see all these pictures of what all the stages of ice actually look like up close. The discussion is very thorough, and the questions are not easy. The material is very well presented with popup charts available when coding the observations. The many pictures and discussion give a good overview of what we observe and why it's important.